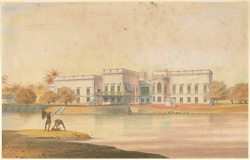 Water-colour drawing of a European house in Madras (Chennai) by Justinian Gantz (1802-1862) in 1841. Inscribed on the front in ink is: 'Madras, 1841.' Justinian Gantz, eldest son of John Gantz, is described in the 'East India Register' as 'Miniature Painter'. He married Ann Philipina Martin at Black Town, Madras, in 1827 and Petronella Duynevell in 1833. He helped his father with the family's lithographic press and appears to have specialized in making drawings of European houses. It seems probable that after the First Burma War of 1824 to 1826 he went to Burma as a Company draftsman. In the entry of his burial he is described as a partner in the firm of Gantz Brothers. Chennai lies on the Bay of Bengal in the north-east corner of Tamil Nadu. It was founded in 1639 when Francis Day of the East India Company acquired land for a warehouse or ‘factory’ which was completed on 23 April 1640. This was the first important English settlement in India and remained the centre of English influence in the East until the rise of Calcutta in the late 18th century. The city was one of India’s major ports and mercantile centres, based around the harbour and George Town, its commercial heart. It has a rich architectural legacy of colonial buildings dating from the 18th and 19th centuries such as this European house.